Held on 5 th to 7 th January 2004 in Jaipur, India . 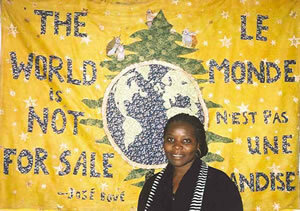 Betty Kituyi of Uganda spoke for Transcend Art for Peace at this conference. The conference was held at the Campus grounds of Rajasthan University where participants from all corners of the world, including a participant from the American Navy gathered to share on this important theme. Peace is everybody’s human right and our lives should raise the peace flag high for all to not only see but experience through our well meaning intentions. “Best intentions, worst outcomes”. This is a famous quote especially in relation to the recent USA led coalition against Iraq . But sometimes, we have not had the best of intentions. It is of utmost importance to consider the outcome of any war situation before any nation, in the name of ‘national interest’, attacks another for whatever reason. We are confronted with war on all fronts: the media, globalization, biotechnology experiments are all threatening our well being on all fronts. We need to be sensitive to these events and study our history to understand where and what we are at so that we protect and preserve that which has woven our communities together for centuries. To speak out for those whose voices are never heard, whose eyes cannot perceive the robbers of their very existence. Our feeling and caring instincts are becoming extinct as we move from community based to individual based. The global commons are being robbed of their common culture of wisdom and history. Children today are watching television in the cradle! Television has replaced a mother’s lullaby. Where is all this leading to? What are we doing about it? Peace activists and researchers must not only speak, they must act for peace and the time is now! Life in India is diverse and complex. Walking on the streets of Jaipur, you are bombarded with humming voices of men, women and little children, asking for chapatti. They will tell you that a rupee cannot buy chapatti meaning you have to give more. For a common tourist, the poverty in India may be ‘entertaining,’ Yet for the majority of the people, it is a depressing, humbling experience, a deep spiritual awakening on the frail side of our humanity. What have these people done to become this way? The rickshaw, is the commonest and cheapest form of transport. But well painted and adorned mighty elephants gracefully march the streets in style to mark the beginning of estive weeks! The camels are another alternative transport but also a quick remainder of the desert climate. It is one place where generations of vehicles have been well blended bring a good blend of old and new! Such tolerance is seen not only with vehicles, a visit at the centuries old palaces of City palace, the wonders of the great Taj Mahal, all display the powerful architectural eye of generations past which stand to challenge the modern eye. There is a great sense of colour and style in India’s fabrics. The women are graceful and elegant in their saris. India’s Jewelry in silver is not comparable to any other. Indian food is mouth watering! The traditional naan and chapatti served with chili sauce will always fill one. A typical vegetation diet! The cows which are ‘gods’ on the street are considered holy and custom does not allow the eating of their meat but the yogurt and milk products are not forbidden. Indians are very warm and welcoming people! My paper follows, which many thought was a breathe of fresh air! This presentation focused on how the Transcend: Art and Peace Network (T: AP) explores the link between art and peace to foster and increase awareness of peace by developing the processes of creativity including music, theatre, visual and literary arts of its members and society. T: AP, an international network with members on all continents, is committed to demonstrating that work for peace can be enhanced by development of creativity in concrete activities that are essential for peace education. Far from being a static source of information and basic knowledge about art and peace, the T:AP website http://tapnet.info is constantly constructed and re-constructed by the input provided by the members of the network. Since there are participants from all continents, representing various cultural, religious and social backgrounds, the building and re-building of the website in an attempt to harmonize different views is in itself a form of knowledge construction. The diffusion of the results of joint explorations is ensured through the e-mail group, since members receive all messages sent by other T: apers from around the world. The information thus shared is further redistributed through the member’s other networks concerning art and peace, and in this way ideas and information are diffused far and wide. It sometimes happens that members disagree on important issues. However, since the goal is to learn how to handle conflicts with creativity, non-violence and empathy, differences in outlooks are used as a springboard to develop better ideas and as a source of knowledge transformation. If we agree that our perspectives on the world are constructions, the exchanges within T:AP are a joint creation and re-creation of meaning and knowledge, an experimental global peace process. Art and peace are an interwoven fabric of shape, colour and meaning in our lives. Writing is a creative art, be it poetry or an essay on war. Banner making, particularly with a group, is as creative and peaceful as bread making. Speaking well is as important in peace work as acting and singing in political musicals. Creativity in one area enhances peace making in another. Nurturing friends and organizations is as creative as making good documentary photographs. Art implies that a human being contemplates aesthetic relationships and allows such contemplation to flow intuitively out of the mind through the hands to create something that we call a work of art. Carl Jung said, “The creation of something new is not accomplished by the intellect but by the play intuition acting from inner necessity. The creative mind plays with the objects it loves.” This interaction between aesthetic contemplation, intuition and creation seems completely antithetical to violence, greed and avarice. Yet the concept of peace seems diametrically opposed to violence, greed and avarice. So peace and art seem, on the surface, in a harmonious relationship to one another. When we wake up in the morning, a work of art has been created. Of course we are also works of art when we are asleep, but to find purpose in life, to make plans and create one’s destiny is the most fundamental work of art there is. People have the power to make a choice, to direct their lives towards peace and harmony, or towards violence and destruction. To us, this question prompted reflection to make a new discovery about ourselves. This discovery is that we have always been preoccupied with issues of form. Especially intriguing is the ways in which issues of form cross the boundaries of what is conventionally understood as art and what is conventionally understood as social science. While some people need absolute calm in order to produce art, many other pieces have been created at times of great conflict and pain. We can ask: Is one more valuable than the other? Or does “consciousness-raising art” have more merit than a purely aesthetic “art-for-art’s sake” work? The artist is free to create, therefore, art in general is an expression of the human spirit, and therefore always deals (directly or not) with human issues. The artist is free, and the spectator/reader/listener/etc. is free as well, to approach and interpret a work of art. basis for understanding and – sometimes – who knows?.. peace and understanding. The process of making art can be a private matter. A safe place to explore the world of self-expresson The process of making art can be a group experience. A project that requires discussing what one wants to do, how one wants to do it, who is doing what and when. Either way, between the vision and the result is the process of making that has its surprises. Do we start from scratch? Do we improvise? Do we change the concept? Do we push through or do we give up? Though we admire the final products of art, I believe the process getting there is almost more exciting. We believe that art can enhance the power of imagination, creativity, compassion, empathy, and vision in human beings. Along with “traditional”anti-war education, peace education through art will play a huge role in the development of peace, in schools, communities, and societies all over world. One of the differences between art and peace is that peace is never final. It will always be a process. Peace education is hence a challenge for us all, a work in progress! T:AP boasts of its numerous projects : Members have created special interest groups, such as T:AP-music, T:AP-poetry, T:AP-Fine Arts and others. One promising project is called “Art of the Refugees”. The goal is to allow refugees from around the world to share their experiences, fears and hopes through the arts and on the Internet, and also to allow successfully relocated refugees to encourage others who are trying to survive in a very difficult situation. This project is now underway with a physical office in Trondheim , Norway . Another future project is T: AP Uganda which is set to empower rural women group (of ten women) to use art skills in quilt making and cross stitch to come up with projects that will bring warmth to the families as well sustaining income through the sale of the finished products both abroad and locally. This project is to take off as soon as enough materials are gathered both locally and from abroad through donations. To conclude, an exploration of the links between art and peace opens up many opportunities for intercultural education, allowing us to uncover our cultural assumptions, understand previously unknown ones, and reconstruct a more comprehensive worldview. In particular, the work of the Transcend: Art and Peace Network, based on a definition of peace as conflict transformation, stimulates exchanges between people from all corners of the world, encouraging them to re-examine their cultural frameworks. Many different activities have been described in this paper. Music and the arts are known for their therapeutic qualities, and blues certainly enables individuals to contribute to peace. It is hoped that the work of the T:AP Network will contribute to intercultural education in many ways, and to the blossoming of art and peace on our planet. Now I take this opportunity to extend my heartfelt many thanks to the Prince Claus fund for funding 100% of my air ticket, The Barnard- Boecker Centre Foundation, Theresa Wolfwood and her husband Gerd Weih for their love and care, both moral and financial for the eleven ten days I was in Jaipur, Lisa (T:AP) for paying for my registration fee and the rest of the T:AP family for inspiration and support , Ellen Elster for sisterhood and wonderful financial contribution, the Jaipur Peace Foundation for inviting me and for good hosting and care at Jaipur!